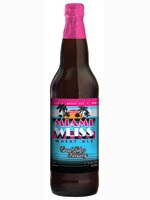 Great Lakes Brewery Releases "Miami Weisse Wheet Ale"
Miami Weisse wheat ale is back! This year it will be available for a very limited time in select LCBO stores. Miami Weisse is our version of an american style wheat beer. It is packed full of hop flavour and aroma and is brewed with 50% wheat to give it an extremely drinkable and light body. Coming in at 4.5% alcohol it is sure to be a favourite summer session beer. Check out Facebook or ourwebsite for availability.